The NordicTrack Treadmill Desk Platinum is a step up from the NordicTrack Treadmill Desk. It caters to people who want to avoid some of the health problems that come with excessive sitting when using a desk. The desk height is adjustable, which makes this treadmill desk useful and accessible to many users. As the main purpose of this treadmill is to help the user move more while working, it does not have many features that other NordicTrack treadmills have, such as entertainment options, workout programs, or fans. So we are not sure that the Desk Platinum would replace a regular treadmill. With that in mind, if you want a high-quality treadmill desk to work from, the NordicTrack Treadmill Desk Platinum is a great option. The Desk Platinum generally goes for $1,499. Want accessible exercise - The Desk Platinum has a wide desk for users to work comfortably from as they use the treadmill. Need to challenge themselves - Able to reach 8 MPH, Desk Platinum users can break into a run to boost their productivity. Most treadmill desks like the LifeSpan TR1200-DTS can only reach 4 MPH. Like room to move - While the width of the Desk Platinum is a bit small at 18”, the length is 60”. This is plenty of room to enjoy long strides and comfortably incline your treadmill desk. Stacked against regular treadmills in its price range, the Desk Platinum doesn’t stack up well. However, when compared specifically against other treadmill desks in its price range, it is the clear winner. Powerful motor - The Desk Platinum has a 3.0 CHP motor, which is larger and more powerful than the TR1200-DTS, which only has a 2.25 CHP motor. Incline ability - Most treadmill desks cannot incline, and the ones which can don’t even touch the 10% incline the Desk Platinum can reach. Convertible desk - Go from walking on your treadmill and using your desk to sitting at your desk. Users can fold up their treadmill and still use the desk portion of the treadmill. While the Treadmill Desk Platinum is a treadmill, it can seem unfair to judge it based on regular treadmill qualifications. So consider the rating recommendation with that in mind. Footprint In Use (W, L, H): 40.5" x 77.0" x 48.7"
Motor Size - The motor in this treadmill is a 3.0 CHP. This motor runs pretty quiet for its size and is strong enough for sprinting breaks as well as supporting incline ability. Running Area - The running surface is 18” wide by 60” long. While the TR1200-DTS is 2” wider, it is only 50” long. The extra length on the Desk Platinum allows for users to make the most of this treadmill desk’s ability to incline without the user feeling like they will fall off the back. Weight Capacity - The Desk Platinum has a higher weight capacity than is usually found in NordicTrack treadmills as it can hold a user who weighs up to 350 lbs. This is a great feature for those who are working on weight management, who also work from a desk. Folding - Another feature we particularly like is the Desk Platinum ability to go from standing treadmill desk to folded sitting desk. Since the height of the desk is adjustable from 26” to 42” high, you can easily position it to suit your height. Users over 6’3” may find the desk is not high enough. Space / Footprint - The Desk Platinum measures 40.5" wide, by 77.0" long, and 48.7" high. It is a light treadmill, which makes it fairly easy to relocate. The desk measures 40” by 18”, giving users plenty of space to work on. Max Speed - The treadmills max speed is 8 MPH. This is double what other treadmill desks can do. While you won’t necessarily need that kind of speed all the time, it can be nice to break into a run and give your work an adrenaline boost. Incline - This treadmill has an incline range of 0% to 10%. The Desk Platinum is one of the few (if not the only) treadmill desk that can incline. 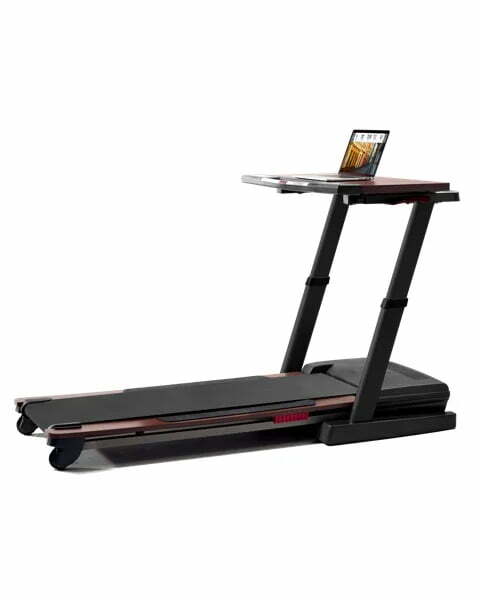 Workout Apps - There are no workout programs with this treadmill desk. However, it is Bluetooth-enabled, so you can sync a tablet with an iFit app to your treadmill desk and utilize the iFit programs with your treadmill desk. Display - A 3-inch LCD screen is embedded in the right-hand, bottom corner of the treadmill desk. It displays your calories, distance, time, speed and incline. There are also speed and incline adjustment buttons next to the display screen. Speakers - There are no speakers on this treadmill. Fans - There are no fans on this treadmill. Heart Rate Monitoring - The Desk Platinum only has EKG handlebar grips for heart rate monitoring. However, this isn’t much of a downside, as you likely aren’t doing heart rate training while working from your treadmill desk. iFit connectivity - The Desk Platinum comes with the ability to connect to the iFit app. When you choose to use the iFit app, you can receive more programs to utilize your Desk Platinum, receive coaching, dietary advice, store work out data and more. USB charging station - If you find your electronics are low on battery charge, then the USB charging station embedded in the desk will be perfect for you. Height adjustment levers - Enjoy easy height adjustment with the Desk Platinum. Levers are located along the sides of the desk. Return Policy - NordicTrack offers a 30-day money-back guarantee for anyone not satisfied with their purchase with a 10% restocking fee. If there is a defect with the product, it can be returned/replaced with no charge. You can break into a run while using the Desk Platinum, though at the highest speeds it does jiggle the desk quite a bit. When you are just walking, the desk remains stable and steady. There are no hydraulics to help lift the deck of the Desk Platinum. However, it is fairly light so you don’t necessarily don’t need hydraulics. The desk can be smoothly detached to make folding the treadmill easy. Interestingly, this treadmill’s side rails are the same wood color as the desk material. There is a runner of non-slip adhesive on the side rails. The Treadmill Desk Platinum will not replace a regular home gym treadmill, but it is an excellent choice for anyone looking to improve their work/life balance. For the best price and customer service, we recommend purchasing the Treadmill Desk Platinum from NordicTrack directly.